How to invest $20k or less? For the ultimate easy DIY portfolio, I have been recommending the Vanguard all-in-one ETF portfolios that will give you global diversification at a very low cost. Simply buy and forget with rebalancing completed automatically. It is common to put these all-in-one ETFs in a registered (tax sheltered) account due to the taxation of the distributions and the regularly occurring automatic rebalancing (generates capitals gains tax). But what about in non-registered (taxable) accounts? Cue the Horizon’s swap-based ETFs. Horizons has created index ETFs that pay 0% in distributions or dividends. Instead, you will only be taxed with capital gains tax when you sell down the road. The dividends are still there but used to compound instead of being paid out. This is attractive in that the ETFs can grow tax-free while you are accumulating and earning a salary. Then, when it comes time for retirement and theoretically lower income, you can sell off small portions of your portfolio and only pay capital gains tax. Next question is, how exactly are they able to do this? This involves a complicated financial instrument called swaps. Essentially, Horizons uses National Bank as a counter-party to deliver the returns of the index. So if the TSX 60 (Canadian large cap index) returns 5%, then National Bank is responsible for paying Horizons 5%. Sounds risky? It’s actually not as risky as the word “swap” sounds. If National Bank defaults on their payment to Horizons, then it’s only the gain that is at risk, not the original invested amount. Also, if National Bank defaults, we likely have bigger problems in the Canadian stock market, and no returns would be given to Horizons. If you had 25% of each ETF, the total portfolio would cost about 0.30% which is not bad for a tax-efficient portfolio. Having the option of using these ETFs adds another weapon in overall tax planning. Horizons has taken it one step further and has created their own version of an all-in-one portfolio with automatic rebalancing using their own ETFs without any extra management fees. As of today, they offer two different one-ticket ETF solutions (website). As you can see from my previous articles, I’m enamoured by Vanguard’s all-in-one ETFs due to the low cost (0.25%) and global diversification. I really like the Vanguard products inside a tax-sheltered account like an RRSP/TFSA/RESP. Horizons shines bright when you have maxed out your tax-sheltered account and have money to create a taxable portfolio. Their swap-based ETFs allow for the distributions to be added to the return of the ETF which is only taxable when you sell (capital gains tax). 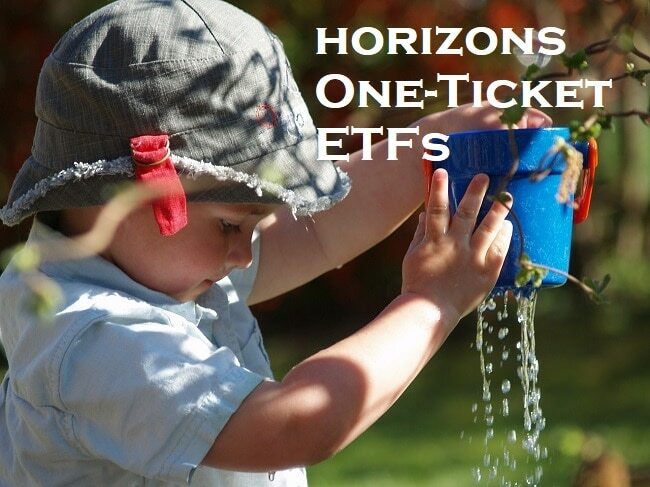 While I really want to love these new Horizons one-ticket solution ETFs, I can’t say that I completely recommend them. The main reason is that since they automatically rebalance on a regular basis, it means that it will generate capital gains tax on a regular basis. Capital gains within a long-term portfolio, although fairly cheap compared to income tax, will create a small drag on the portfolio. Second, they could have been more efficient with the holdings within the portfolios. For example, the NASDAQ ETF (with its high MER) holds all of the largest technology stocks in the US, but then, so does the S&P500 ETF. Personally, I think an investor would be better off building their own Horizons portfolio, rebalancing when adding new money to the portfolio, and selling only when you absolutely necessary. For completeness, here is the portfolio that I would go with within a non-registered portfolio. For ultimate efficiency, consider opening a non-registered account with a brokerage that allows you to trade ETFs commission-free. I semi-recently opened a non-registered account with Questrade for my wife (her TFSA and RRSP already maxed out) for this purpose. What is your ETF strategy? Have you simplified with all-in-one products yet? I’m curious why they haven’t launched an all equity or 80%/20% like VGRO? I’ve read in many sources that it is more tax efficient to put your fixed income in an RRSP and your equities in taxable accounts. I’ve also read sources like Dan Bortolotti and Justin Bender warn that the government may disallow total return products like these to ensure dividends/interest are paid and taxed annually so there could be a risk to using these. I think part of the reason may be that investors looking for asset location strategies, are likely managing their weightings themselves so they are more likely to be using individual funds, since they likely also want to manage not only want to weight equities in non-registered accounts, but also control the amount Canadian vs non-canadian equities in different accounts. So in general, I can see why Vanguard isn’t building products geared to that market, since there is probably a good portion of that market where it wouldn’t be a fit, and its far harder to create something very general for that market in particular, since the weightings will heavily depend on what percentage of the total assets are in each type of account. If anything, I think Vanguard will maybe create an all in one solution aimed at tax efficiency as a whole rather than asset allocation strategies that might be a better fit for people using asset location strategies. Thanks for the perspective Danny – that makes a certain amount of sense from Vangaurd’s point of view. I guess I would have thought an all equity portfolio would be appealing, as many fund-of-fund offerings offer 100% equity solutions. I like the idea of a tax efficient offering. Let’s hope! I think with Vanguard offering just 3 in the outset they are looking to streamline. I do think they will likely add a more aggressive option, but my guess is it will be 80/20. An 80/20 mix has a better risk adjusted performance than a 100% equity mix, so given that Vanguard has been a bit conservative in not rolling out too many of these options all at once, I think they will likely play it safe when they roll out a more aggressive option and it will probably be something more similar to an 80/20. I also think at some point they will look at creating a tax efficient product but again their conservative approach leads me to think they will offer it as a solution for those that want one of the pre-packaged portfolios in all their registered accounts, and then a tax-efficient solution in their non-registered. Thanks for this! I just opened an unregistered account earlier this year and am using HBB, HXT, HXS and HXDM. I still consider myself kind of new to DIY investing, so it’s nice to see some reinforcement that I’m making some good choices. If these funds are held in a non-registered corporate account, how much more in tax savings would these funds produce over XIU, XAW and ZDB? Over a 5 or 10 year time horizon will there be any significant differences in the portfolio values? The advantage in a corporate account should be about the same as a personal account. That is, the benefit is that you won’t need to pay taxes in dividends on an annual basis, and potentially only capital gains tax many years down the road. In most cases, the marginal tax rates on capital gains are quite a bit lower than on eligible dividend income. Another win! Do you see any downsides into why an investor should not make the switch to these Horizon funds in a non-registered account? Just curious, how would these tax-efficient funds do in a bear market compared to the standard ETF’s that distribute dividends? I have stuck to a a DIY ETF strategy. I love the idea of an all in one ETF but I don’t want bond exposure. I am using my TFSA and RRSP for retirement so the time horizon is 30+ years. With that time frame I can handle the volatility of stocks only and hope to make a larger return. That’s a good point GYM, and something that very well could happen! If this happens, what would the risk be? End up paying back taxes that you would have paid anyway? I’m seriously considering using the horizon ETF’s in my non-registered as I’ve long since run out of room in my registered accounts and don’t really want to hold bonds in my non-registered or rebalance to increase bonds in my TFSA (most bonds currently in RRSP). But I don’t want to do this if it’s too risky. I have not heard any whisperings swap based investments being targeted , so we are talking about speculation. I doubt that gov would backdate taxes (although who knows), I would say worst that would happen is that you sell your ETFS for a capital gain in the future. Thanks for the blog. What % you would suggest for HXT/HXS/HXDM/HBB in non-registered portfolio? I’m just curious what’s FT’s thought why he is not considering to have “US 7-10 Tresury Bond ETF” in his personal pick of index from Horizon’s. Thank you. This is great info, thanks. I’m taking my first steps to starting my own investments at 56, mainly because you and other money bloggers bought to my attention the horrendous fees I’m paying in my current RRSP with Investors Group. I’ve had some good advice from them but paying 2.33% fees on my mutual funds is way too much. Shame on me for not catching it earlier. The Questrade account is open, the first money will go in shortly. I’m still not sure about some stuff, like why you need to rebalance, and I think with an RRSP I am obliged to maintain a certain percentage of Canadian stock, but I can pick up that as I go with some more reading. Thanks to you and the other determined investors here! Next post: Canadian Financial Summit 2018 – All Online and FREE!